I’m back from my blogging vacation. And I’ve got a question for you all. War Words – I am so addicted to these now. You and your writing buddies set up a time to be online together. It can be on facebook, via email or on a community forum like inkpop. You set the start time in minutes (as in :30) and how long you’ll write for (fifteen minutes), write like crazy at the start time then post what you wrote in the time with the word count and get feedback from your buds. Create a writing play list and then listen to it – keep a note pad handy because those creative juices are often stimulated by melodic sounds. 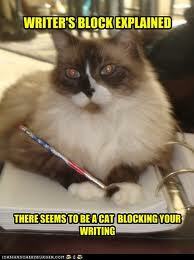 And if you are still stuck after those, try google fun cat pics. It won’t cure your writer’s block, but it’s a lot of fun. 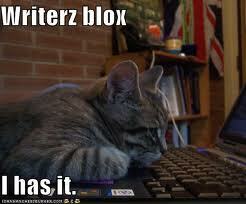 What’s you’re cure for writer’s block?